– This is one of our most popular experiences and space is limited. – Please schedule your desired date / time in advance. For most people the opportunity to go canyoneering is a once-in-a-lifetime experience. Once you’ve tried it, you’ll want to do it again. 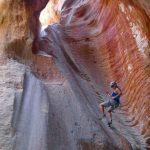 The term Canyoneering was virtually invented around the Zion National Park area. This region is filled with many slot canyons that have been carved by water and wind. These fluted natural masterpieces are marvelous places to explore. During the daylight hours, the sun reflects off the canyon walls and illuminates down into the deepest recesses of these cavernous rock formations. The red hues of the sandstone in the Zion National Park area make these experiences all the more spectacular. 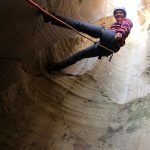 While canyoneering you’ll feel as if you are entering another world and, for a while, you will be taken away from thoughts of the everyday as you venture with your guide. Zion Ponderosa guests rave about their canyoneering experiences. You’ll see from the pricing structure below that it is most economical to go with a group. You can choose from a full day canyoneering experience of eight to nine hours or a shorter day of five to six hours. Please note that there is an 18% gratuity for parties of six or more people.